Soon to be released is The Angry Birds Movie, coming to screens in May. 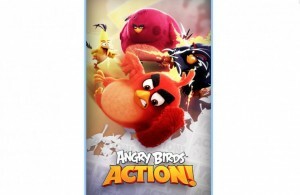 Before its release, Rovio has released another hit game – Angry Birds Action for mobile devices. The game, which was developed by Tap Games is essentially an Angry Birds themed pinball, where players are able to fling around the bird character to complete their various goals. Throughout each level the player is required to drag their finger over the screen to take their aim and lift their finger to shoot. Once the bird fires out, it bounces around the screen through obstacles and hits objects around the screen until it stops. Different levels of the game have various boards available, each with their own goals to accomplish. The goals may be to collect candy by running through them or rescue eggs by knocking down the pillars they are on top of. Each player has a limited number of birds to clear the board with however each of these birds may be used for multiple shots before exiting the screen. To kick the game off, players will start with red and over time will unlock additional birds. For example, bomb would set off a blast when he hits another object. After the movie is released, a bonus scene may be unlocked as well as Piggy Island of content, which is done by using their device in the movie and allowing the game to listen to the film during the credits. Angry Birds Action is available for a free download from Google Play and iTunes App Store.